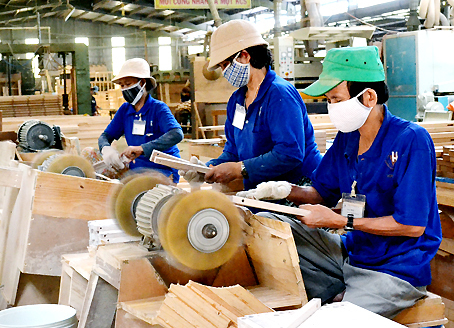 DONG NAI (VNS) — Several initiatives by authorities and organisaitons in Dong Nai Province have helped local enterprises expand their export markets. The main imporovement has been in sales to the United States, which have risen by at least 10 per cent since last year. According to Nguyen Ngoc Tuan, Vice Chairman of the Dong Nai Import-Export Association, exports to the US hit US$3.17 billion, accounting for about 30 per cent of the province's total revenue. And 2014 is expected to be also a good year. Tuan advised local enterprises to heed the technical requirements of theUS market. He said that from this year, disqualified exports will no longer be allowed to be re-exported, but will have to be destroyed. The provincial Department of Industry and Trade reports that businesses have received ample orders from the US. enough to ensure full operations until the end of the second quarter. Key foreign currency earners include garments and textiles, footwear - and timber and agricultural products, it states. Departmentalhead, Le Van Danh, believes that local exporters will enjoy more opportunities in the US market this year, based on the forecast of higher growth in the US economy and hopes that the Trans-Pacific Partnership (TPP) agreement can be concluded later this year. He said that the department recently held a meeting with the American Chamber of Commerce in Viet Nam to discuss ways of improving ties between businesses in the US and Dong Nai. The department is also planning to collaborate with the Ministry of Industry and Trade to organise workshops on the TPP and Free Trade Agreements Viet Nam has signed for exporters in the province. According to Danh, the provincial authorities will be working closely with businesses to offer timely support in overcoming obstacles and offering updated information on the local import-export situation and credit packages.